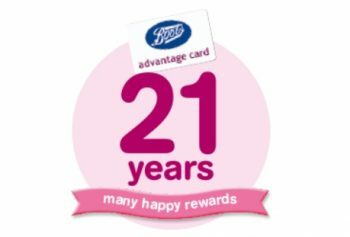 Boots Advantage Card is turning 21 and celebrating this by giving away lots of bonus points. If you spend £50 or more you will get 21 Advantage points per £1! And there’s also a competition with a prize of 1 Million points. To earn 21 Advantage points per £1 you need to spend £60 online or £50 in store. The bonus points will be added automatically. The in store part of the promotion ends on Sunday. 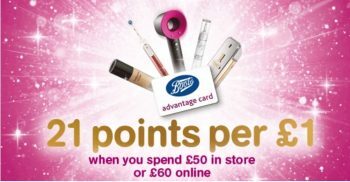 On Boots.com you can earn bonus points until Monday. Simply open your Boots app, go to ‘my offers’ and enter the competition. The main prize is 1 Million Advantage points – worth £10,000. But everyone who enters will win something from double points to 5,000 bonus points.